In a recent renovation, we ran into galvanized pipes. By it’s very nature, you’d think that galvanized piping wouldn’t rust. And you know, it does last a LONG time. But not forever. 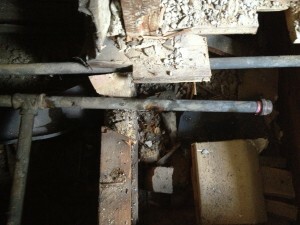 Galvanized piping has a 50-year life span. I estimate these pipes to be in the 80 year range. So what’s the big deal? Well, it starts with poor water pressure. The pipes rust from the inside out. They fill with rust, slowly, year after year until finally, you have no more pressure. It happens with the hot first. That’s the good problem. The bad problem is that they can burst. See that picture above? On the bottom pipe you see three discolorations. That’s rust where the pipe has rusted right through. It is now leaking because there’s simply no more metal – it’s all rust. Many insurance companies won’t even insure your house if they discover that you still have galvanized. If you have a one-story house with an open basement – no problem. Swap it out (in fact, it’s probably already been done). 2 and 3-story houses become more challenging.